ce gréement, un genre de croisement voile de jonque / voile Marconi a été conçu par Paul McKay. Le concept est intéressant cependant j'ai quelques doutes sur la possibilité de conserver des formes de profils à peu près correctes. Le projet en est pour l"instant encore à l'étude avec une application en taille réduite. "May I introduce the AeroJunk, a sail that looks like a standard Bermudan Rig but works like and is a Junk Sail? Some junk sails can look pretty strange and would not appeal to the average sailor. With this design I would hope to gather a few converts when they realise just how safe and easy it is to sail. 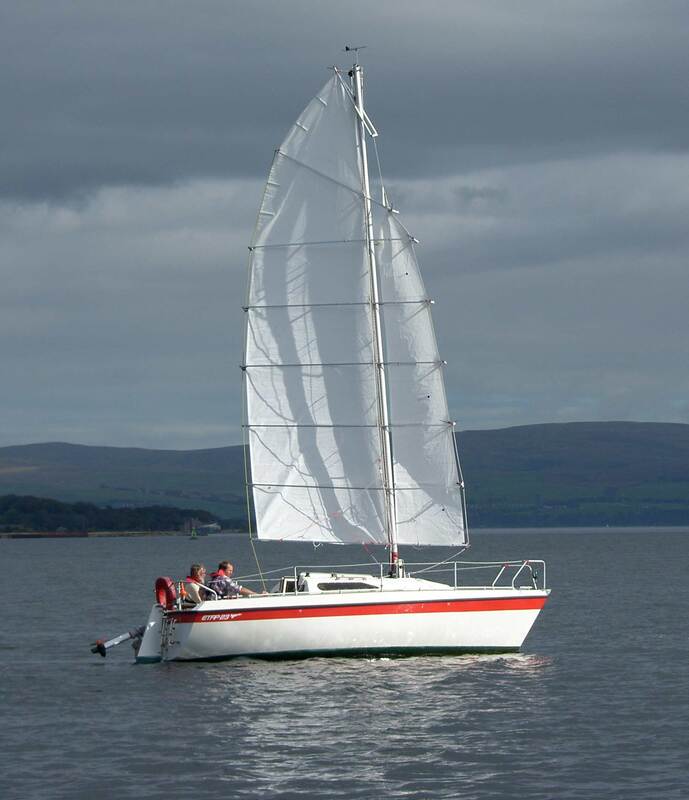 Both sails are cut and sewn completely flat – no broad-seaming. It is the battens that produce the shape. There are a number of brass eyelets fitted to the sails but each one has a job to do. The Jib is bolted to the battens through the luff at each batten front. On the boom only, there is a sliding cross-rod in front of the mast. The jib foot/leech eyelet runs along this rod on each tack to prevent the jib lifting. 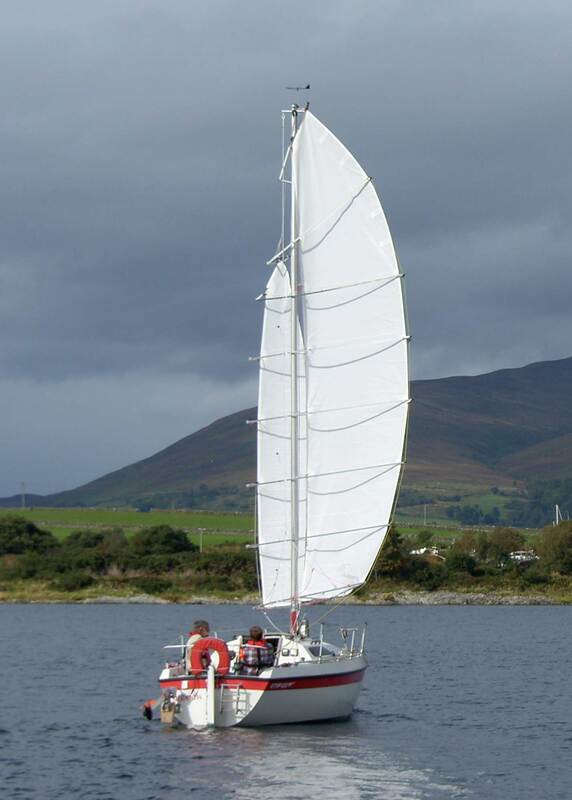 The jib headboard is centred on a cross-rod in front of the mast on batten 5. The main is bolted through the leech at each batten. The mainsail luff is centred behind the mast on cross–rods spaced with pieces of plastic waterpipe. There is an additional eyelet approx 75mm behind the luff eyelet at the boom and battens 1 & 2. This is a ‘Cunningham Hole” that allows you to tension the mainsail with some fixed line to produce the chord desired. 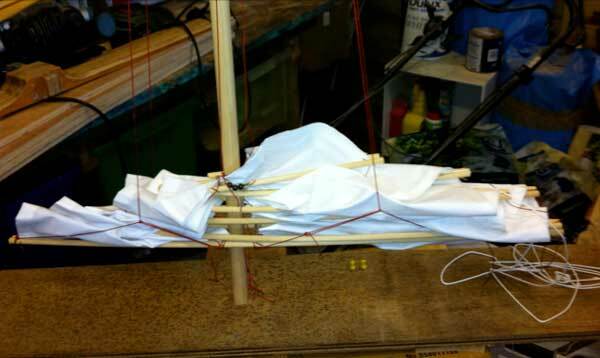 From experiment, a space across the battens of 3x mast diameter allows a Jib ‘sheet’ angle of 10 degrees. This space can be reduced to 2x further up the mast. 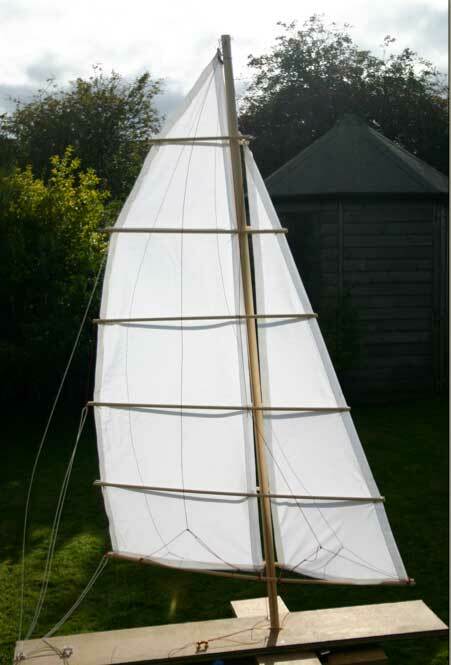 Finally, the eyelet in the centre of the mainsail at each batten is only needed for lightweight plywood battens when an extra slide-rod helps preserve the shape and stiffness. The top triangle above batten 5 can be regarded as optional. If used two small sheets of lead (Builder’s flashing) should be added to the headboard to help bring the sail down. Make the sails first then lay flat on a floor leaving a gap for the mast. Lay a length of straight batten on top to mark for the fixing holes. After drilling both halves sandwich the sail with nuts and bolts then screw out or pull the halves apart to the desired dimension, adding spacer tubes to the cross rods. The battens will take up the correct shape. Battens 4 and 5 might need to be pre-bent because of their short length. For a stepped mast fit the jib luff bolts (and jib slide rod) with wingnuts. This allows for easy fitting and removal round the mast. 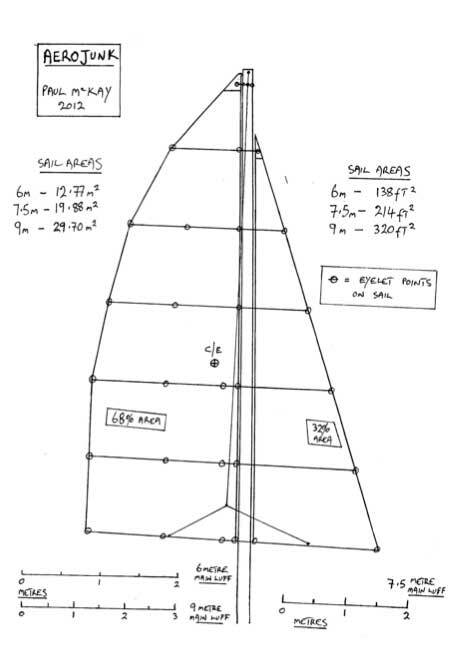 The halyard uses a standard 3:1 purchase and the sheet runs via sheetlets as normal. ‘Lazy Jacks’ are fitted to the boom as normal. The mainsail headboard is tethered round the mast by parrel beads. There is no need for any additional adjustment or hauling ropes. 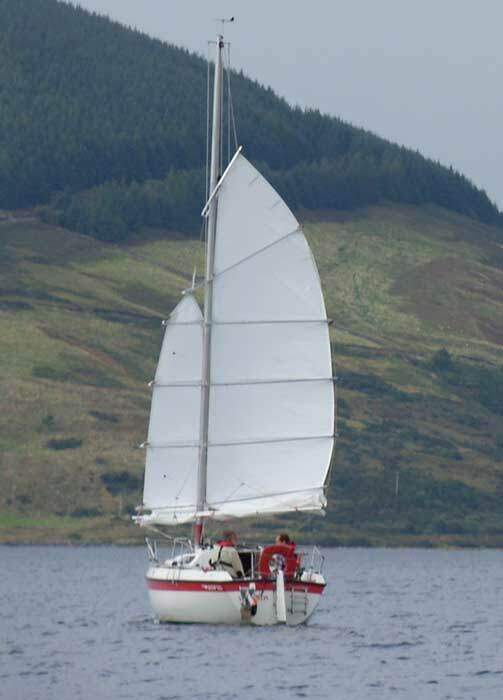 On either tack the whole rig hangs to leeward leaving both sails clear of mast interference. 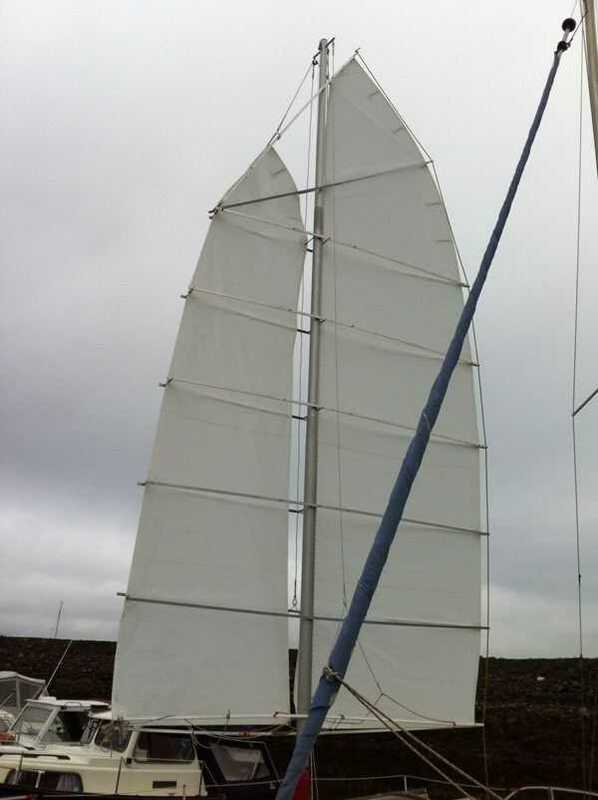 Each sail takes up the curvature of the batten and the jib ‘sets’ itself to a sheet angle of about 10 degrees providing the ‘slot’ that accelerates air past the main. The sheet angle can be reduced by fitting stoppers on the slide rod. The Centre of Effort remains inboard close to the mast on all points of sail thus reducing rudder drag. 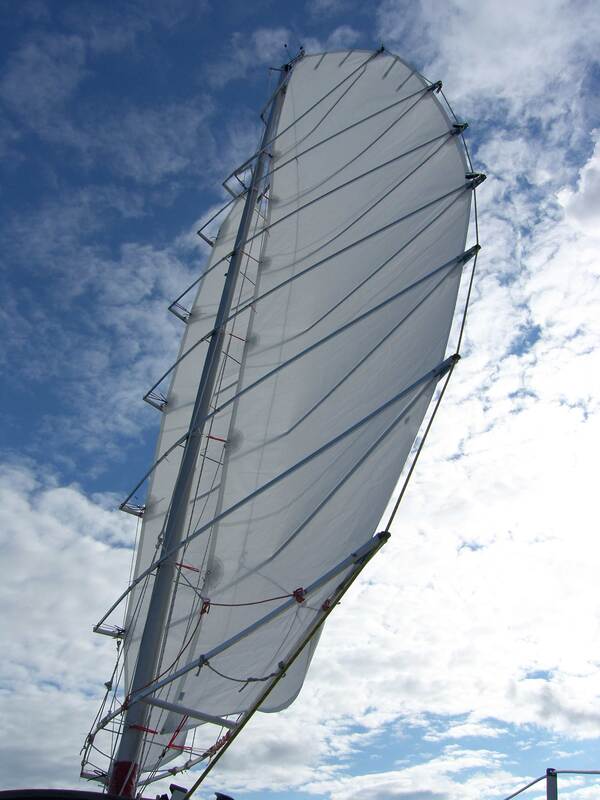 As with all junks, it is soft-gybing and the whole sail can be let out to 90 degrees downwind for better performance. Finally, the sail is reefed with the halyard by dropping one batten at a time into the lazyjacks." ca me rappele furieusement l'aeorig !sinon l'idée n'est pas mal si pas trop de poids en haut ! Pas de doute, ces anglosaxons sont épatants ! Paul McKay continue son bonhomme de chemin avec détermination et efficacité. En cet autommne 2013, Paul nous livre une version qui parait déjà plus aboutie, après avoir réglé le problème du foc. Paul est très satisfait du résultat sur son Etap 23. Qu'il faut temporiser puisque la voilure n'a été essayé que par petit temps (vent ne dépassant pas force 3). Tout nouveau gréement demandant d'être confronté à tout type de temps et conditions de mers avant de pouvoir espérer devenir une réelle alternative. Pour les images ci-dessous, les ouvrir dans une nouvelle fenêtre ou onglet afin d'obtenir un format supérieur et donc des détails assez précis.